Today I’d like to introduce you to 4 highly effective Kettlebell Complex workouts that get a huge amount of muscle and cardio excitement in just one fluid movement. 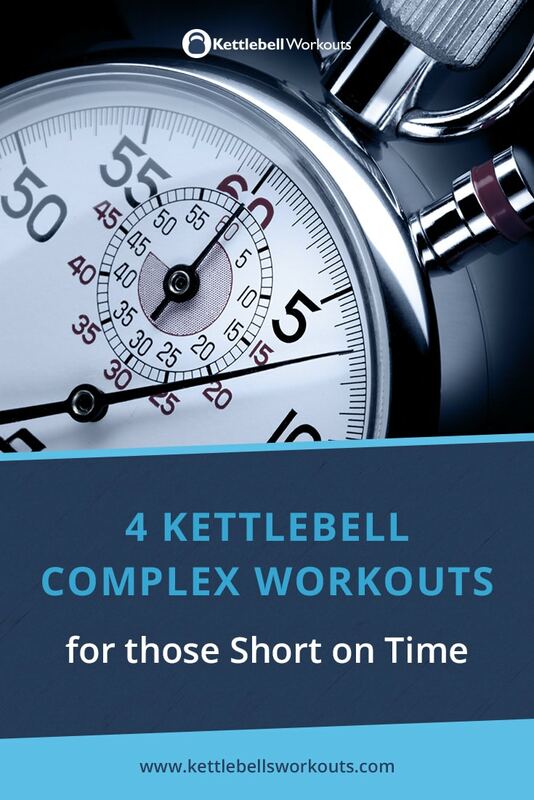 I’ve included 4 kettlebell complex workouts so you can gradually progress from the easiest one to the more challenging one as your skills and strength develop. Kettlebell complex workouts take two or more kettlebell exercises and piece them together into one fluid set of movements. 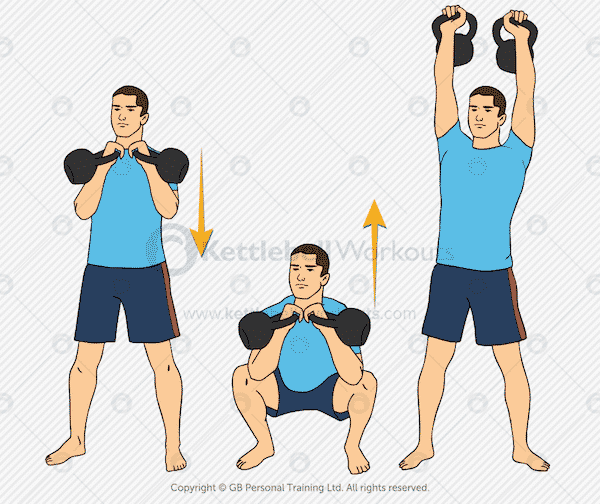 At it very simplest the kettlebell clean and press could be referred to as a kettlebell complex because it involves the kettlebell clean and then the kettlebell overhead press. Similarly the kettlebell squat and press could be considered a kettlebell complex too. Kettlebell complexes can be performed as a flowing number of exercises that are performed back to back to produce just one repetition, or each exercise can be performed more than once before moving onto the next exercise. Kettlebell complex workouts are more effective when they are limited to certain flowing exercises and the patterns are kept simple. Thought has to be placed on what exercises target which movement patterns so as not to over exposed a certain movement. If you want to get the most out of your kettlebell complex workouts then I suggest you use large multi-jointed movements that target as many muscles as possible. Below I’ve listed 4 progressive workout complexes, each one getting more and more challenging. Start at Level 1 and practice the movements independently. Only when you can perform the movements perfectly should you attempt the kettlebell complex. 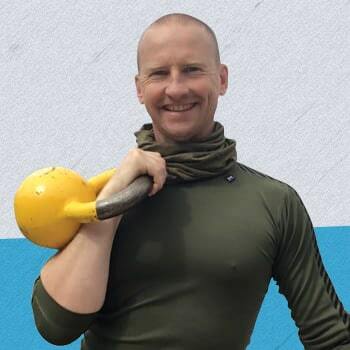 Rushing through a kettlebell complex without good technique will only enforce faulty movement patterns and could even result in injury. Only when you can happily complete the Level 1 complex should you progress on to Level 2 and so on. Clean ==> Reverse Lunge ==> Clean ==> Reverse Lunge etc. Work up to a total of 12 reps before changing sides. Once you can manage 12 repetitions on each side move on to Level 2. The kettlebell clean is a big full body exercise that uses most muscles in the body. 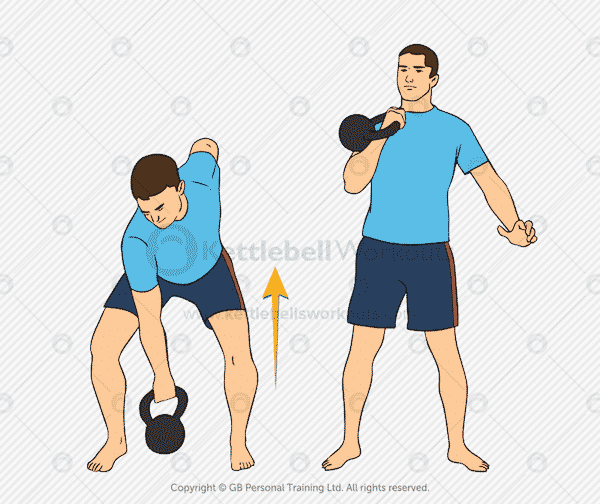 The kettlebell should start from the dead or stopped position at the bottom before pulling the kettlebell up with the hips, legs and buttocks. The arm is used merely to guide the kettlebell up and into the racked position. The kettlebell should travel up in a straight line and stay nice and close to the body. At the top of the Clean the arm is wrapped around the kettlebell to avoid banging the wrist. 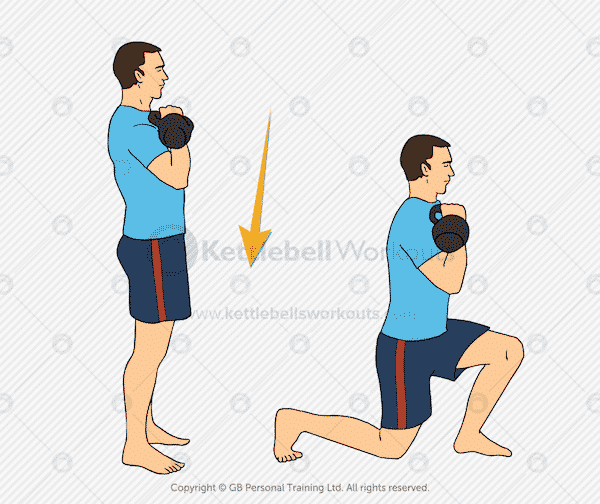 The kettlebell reverse lunge is another full body exercise that uses 100’s of muscles during the movement. It is very important that the rear knee touches or gets very close to the floor in order to activate the buttock muscles. Keep the chest up and eyes forwards during each repetition. Bracing the core and abs will help to stabilise the movement. If you find that the reverse lunge causes you knee issues then you may be lacking strength in the legs to perform the exercise. I would therefore recommend that first you practice without a kettlebell and if that doesn’t help use the squat exercise instead. If the lunge just doesn’t work for you then you can replace the reverse lunge with the racked squat instead. Once you are comfortable with the Level 1 complex you can start adding in a third exercise. Clean ==> Reverse Lunge & Press ==> Clean ==> Reverse Lunge & Press etc. Again work up to a total of 12 reps on each side. Once you can complete this complex with ease move onto Level 3. The kettlebell reverse lunge and press takes the standard lunge and adds even more muscle activation. 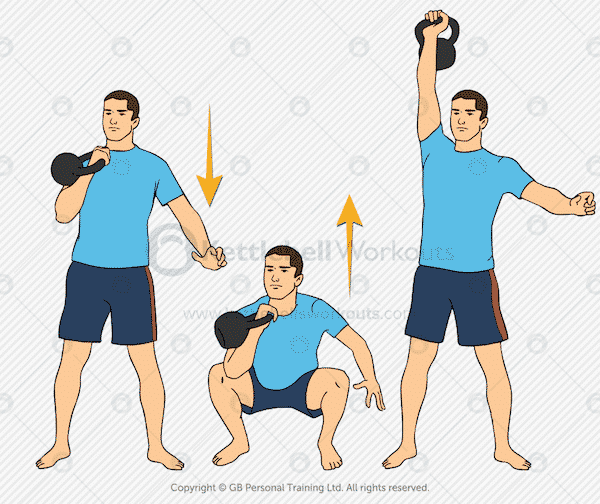 Not only is the kettlebell reverse lunge and press a full body exercise but it’s very cardiovascular too. Use the same technique for the reverse lunge but then as you return to the top position use your momentum to drive the kettlebell overhead. It is possible to separate the overhead press from the reverse lunge but you will find by combining the two movements the exercise flows better. Make sure you control the kettlebell down from the top position back into the racked position on the chest. You will need to be comfortable with the overhead press and overhead hold before moving onto this kettlebell lunge variation. 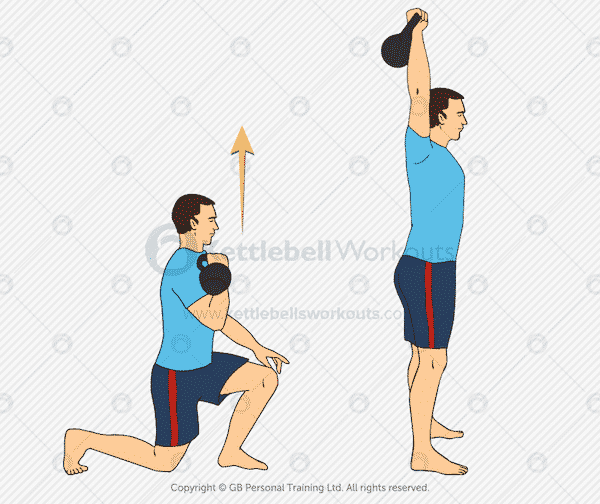 See videos on the Kettlebell Windmill and Kettlebell Turkish Get Up to develop your overhead strength and stability. Clean, Squat & Press ==> Reverse Lunge etc. The Clean, Squat and Press is a huge full body exercise that takes some thinking about. You may find it helpful to repeat each part of the exercise to yourself as you perform it e.g.. Clean, then Squat and into Press, then back to the racked position. There is no doubt your heart rate will elevate quickly during this exercise. Take your time and make sure that each section of the 3 exercises is perform perfectly. Finally, it time to add in another kettlebell and perform the Level 3 complex but with 2 kettlebells. Your goal is a total of 12 repetitions of the Clean, Squat & Press and a total of 24 Lunges. If you have been performing the complexes with a 16KG (35lb) kettlebell then just be careful quickly adding a second 16kg. You may want to try 2 x 12kg (26lbs) kettlebells first just to practice. There is a tendency with Complex movements to rush through them and neglect good form. Don’t do this. Take your time and enjoy them. Complexes are neurologically exhausting so don’t overdo them… 1 – 3 sets is enough. Start at level 1 and progress slowly making sure you are comfortable with all the exercises before moving on to the next level. 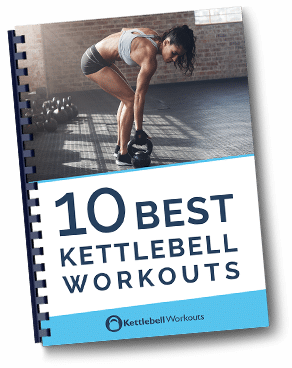 You can perform kettlebell complexes as a supplement to your regular workout program. As with all training listen to your body and take a day off when needed. Kettlebell complex workouts are a great way to get lots of muscle activation and variety in a short amount of time. Before embarking on a kettlebell complex workout you should first master each of the individual exercises involved. Don’t rush through the movements and make sure your form is spot on for every repetition even when you start to fatigue. Have fun and enjoy the workout complexes. I’m going to try level 3 because it seems interesting and physically demanding. Although I turn 51 I think I’m pretty fit so I’ll tell you when I get this goal.